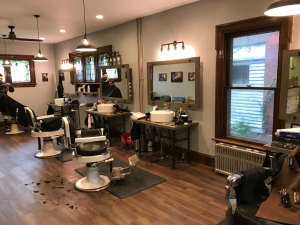 True Gents Barbershop is located on 143 East Main Street (next to the Bloomsburg Diner). 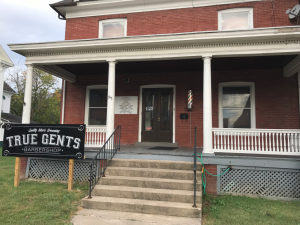 True Gents is a relatively new business opening in December of 2016 to owner, Brent Robinson. He tries to embody a modern-rustic theme, while also having a kick of old school style in his barber shop. When you first walk in you are greeted by any of the four barbers Brent, Bri, Devonte, and Paul. They are all artist in their craft and are there to make sure you get a haircut to your liking. 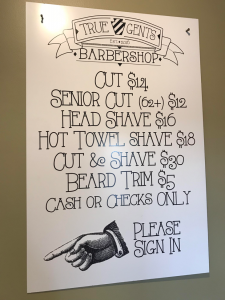 They offer an array of services from straight clippers to a beard shape-up or even a straight razor cut. You will always walk away looking like a ‘TRUE GENT’. WALK-INS ONLY. CASH ONLY.